The world of native bees, why care for these little buzzers? Join Dr. Gordon Frankie for an overview of the characteristics of the 1,600 species of Native Bees that we have in CA. They are very diverse in their life styles and not that easy to study. As for what they do, have you ever wondered why we have such a diverse flora of flowering plants in CA? You probably know the answer to that question. Most of the ~6,500 plant types in CA need these bees for their reproduction. Bees alsopollinate a lot of plants in our human food supply, and only recently have they begun to receive credit for this important roll they play every day. Dr. Frankie will also discuss how the Bee-Flower evaluation garden at the UCB Oxford Tract is used to develop useful info on the bees, and then how that info contributes to establishing habitat gardens in urban areas and more recently in Ag areas in Brentwood and Ventura County. Gordon Frankie is a professor and research entomologist in the Division of Insect Biology, College of Natural Resources, University of California, Berkeley. 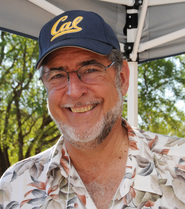 His specialty is behavioral ecology of solitary bees in wildland and urban environments of California and Costa Rica. He also teaches conservation and environmental problem-solving at UC Berkeley. « June 24, 2016 – Extinction!